In his study, The Whites of Their Eyes, Paul Lockhart reminds the reader that aside from being the first “honest-to-goodness battle” of The Revolutionary War, the battle of Bunker Hill had no particular tactical or strategic significance to the outcome of the conflict. His study is more about the consequences of the battle than the fight itself. In the process, he peels away the mythology and leads the reader carefully toward a revelation of the real importance of the battle. Surely, the colonial militia lost this military engagement. The British regulars who defeated them had a larger force, were better trained, more thoroughly equipped, and led by more experienced officers. Under such circumstances it should not surprise that at the conclusion of the battle, the British were in possession of the ground defended by the colonial militia at the beginning of the fight. But at what cost? Of the 2,300 British infantry involved, 226 were killed and 828 wounded. Of the latter, 250 of them died of their wounds. So the British suffered casualties in exceeded 40% of their force. But more embarrassing to their officers was the lack of discipline shown by their troops. And as Lord Howe watched many of his troops flee in disorder to the beach below the hill, he said it was, “a moment I never felt before.” So, as shocking as were the casualties, the lack of order among the troops was even more disconcerting. Despite the victory, the news of such a catastrophe so angered George III that he relieved General Gage, Admiral Graves, and Lord Dartmouth the Secretary of State for Colonial Affairs of their jobs. In addition, he ordered the Army presence in the American colonies increased to 10,000 men and sent emissaries to Europe in search of mercenaries to help put down the colonial rebellion. The British then announced that the leaders of the colonial rebellion were traitors. At that point, most colonial leaders could see that there was no sense courting death only to compromise with Great Britain when the risk was no greater if independence were the object. So the die was cast for them, too. Mr. Lockhart points out that after Lexington and Concord, there was a chance for colonial grievances to be settled peaceably. But after the battle of Bunker Hill any possibility of compromise or reconciliation was gone. Thus, at this point it was seen as necessary to find a military leader under whom all the colonies could unite—a leader subject to the orders of the Continental Congress. John Adams of Massachusetts argued successfully for the appointment of George Washington, a Virginian, to head up an army for the Continental Congress. When Washington accepted the responsibility there was no truly continental army. But the militiamen of New England, the rag tail army of Bunker Hill, kept the cause alive until one was formed and trained. 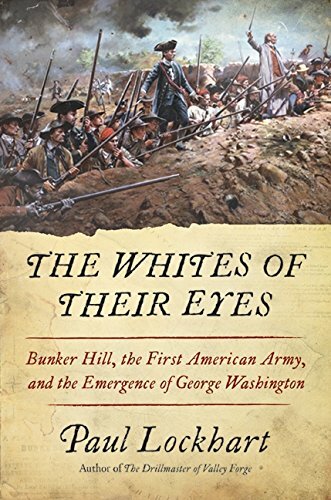 Paul Lockhart’s study, The Whites of their Eyes, is a fascinating exposé of the true importance of the battle of Bunker Hill. It deserves a prominent place in the library of anyone interested in understanding the American Revolutionary War. Dr. Michael J. Deeb is the author of three novels: Duty and Honor, Duty Accomplished, and Honor Restored, as well as The Lincoln Assassination. He is also a retired university instructor of American history.